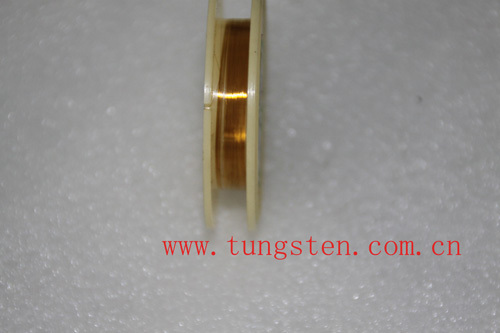 The diameter of gold plated tungsten wire produced and supplied by Chinatungsten Online is 0.06mm with 3um gold coating. High-temperature-resistance; anti-corrosion; oxidation-resistance; high-melting-point; low coefficient of thermal expansion, etc. The reasons for plating gold coating on tungsten wire is to protect tungsten wire form corrosion. The gold coating performs well at corrosion and oxidation resistance. *Gold plated tungsten wire used in medical field in recent years. It replaces the platinum alloy and platinum, used to prduces medical device with lower cost and improving quality. *Applicated for braiding or radiopauqe coiling. The special size of gold plated tungsten wire could be discussed.